This model limits the input signal to a minimum and maximum jump and a minimum and maximum rate. 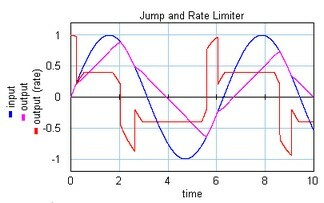 En example is shown below where a sinusoidal input signal is limited to a minmum jump opf -0.2, a maximum jump of 0.2, a maximum rate of 0.4 and a minimum rate of -0.4. Minimum jump of the output. Maximum jump of the output. Minimum rate of the output. Maximum rate of the output.